Even before I officially began my studies in Psychology, as you can read in the introduction I worked in law enforcement, not exactly a profession where you think of as officers listening to anyone, but a lot of the time those of us who wanted to, could do so. For me it was never about moving a vagrant from a certain area because shop owners or businesses wanted him gone, sure I might have to do it, but you could give them a certain dignity. Sometimes, they just wanted someone to listen to them, they wanted to talk and be treated as a human being even if their circumstances had gotten beyond their control. Sometimes, sure it was because of alcohol or drugs, but sometimes it was not having money, or because of a bad time or luck befallen. Partly why I left that profession was I wanted to help in a different, more practical “on the level” way, and too many officers used their position and power to unnecessarily silence others. Anyway, this post is about the man I met in the photo. He was ninety-three years old at that time, in 2006. I met him at a Natural History Museum in Atlanta, Georgia, USA. He was a volunteer there. He played the piano in the dining area. He played it beautifully, with such love! His fingers were fluid over the keys in a way his body could not move as he walked. It was a quiet day at the museum, and only a few people were in the dining area. Most of the tables were empty, and to me, the sound of the piano was soothing as one looked out of the windows into spring sunshine. And then someone started talking. Someone started talking loudly to their children, trying to drown out the music even though you could speak lowly right next to someone and be plainly heard. It was if they were annoyed by Chopin’s etudes, and wanted to make their very Southern accent, strident admonition to their children and generally derogatory remarks about the place in general to be foremost in the room.The piano player kept playing. He was Hungarian, he was Jewish. At the rise of the Nazis began, he had been entreated by his family to leave Europe and try to make a life in the USA and since he was male and single, he could carve a place for them and make a landing point others could come to. He had resisted for a while, not wishing to leave his family but finally with his collected and donated savings had found a way out yet he hadn’t been allowed into the USA. They were denying at that point: too many asylum seekers citing problems of growing anti-Semitism the US was not yet believing in the seriousness of, plus he didn’t have anyone to sponsor him. He said he had wanted to be a police officer. A good one. The US hadn’t let him in but Canada has accepted his petition, and for fifteen years he had worked odd jobs within a Jewish community he had been accepted into. He’d worked as a baker’s assistant, selling newspapers, night cleaning jobs. He had just wanted to live, but as news became more dire about the Jewish people and others in Europe, he said he felt an overwhelming desire to return to help, but couldn’t do that either. He couldn’t bring anyone over as he was, but he had believed that if he could get into the US, the land of golden dreams, he could make his dream come true. He could bring his family over. His parents, cousins and other relatives. That never happened. They were among the millions murdered, whether in concentration camps worked to death, outright slaughtered or worse, before they met their end. When he’d learned they’d been deported and died, the focus he had to get into the US became his overwhelming commitment. He felt he still had to make that possible. He said it was what kept him alive through all the feelings of guilt that he was still alive, and the depression and rage, the grief and sadness. He had waited to have any family of his own: a wife or children, just to work and save as much as possible. When he finally got the approval, though it had been fifteen long years of application and denials, it was his greatest accomplishment he said. “Did you not feel bitter?” I asked. He’d eventually made his way rather improbably to Atlanta, but it was warmer and he said he found the African American community there very friendly and more accepting of his past and situation than some other groups had been, even some of the Jewish communities he’d tried to make contact with. He never married. He said there was a sadness he could never get over within himself, but he loved music and playing the piano and making people happy if he could. He said he had volunteered and been playing at the museum for several years. When I remarked on the, what I considered rude or ignorant “guests”, he just shrugged and kept smiling his little smile. He didn’t do it for them he said, per se. He did it for a purpose: to have someplace to go during the day, a schedule, a place to be. He said he did it for people like me. It might be one out of a dozen who actually stopped to say, “Thank you” or one out of a hundred who stopped to actually chat for a while. That small percentage, just like the ones who escaped or were liberated from Auschwitz or Sachsenhausen were enough for him he said. That was six years ago. 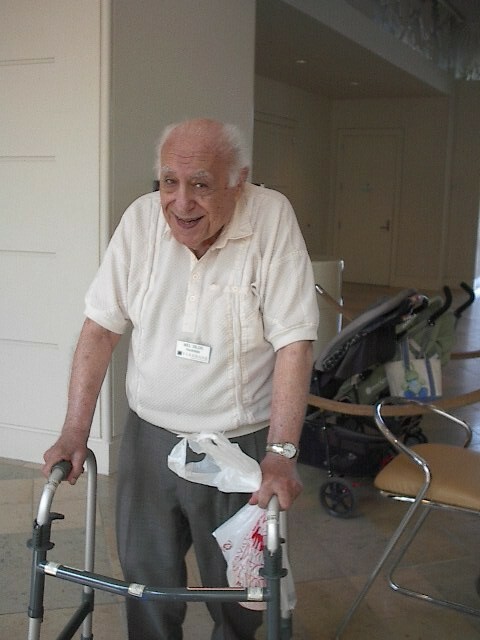 I would imagine he might have passed by now, but I wouldn’t put it past his determination and strength to still be making his way on his walker to that piano in the dining room of the museum café and sharing the good parts of his memory and lessons from far away Hungary with those who took the time to listen and appreciate. When I asked to take his photo, he was estatic and posed for me, and we talked more as he had finished for the day and we headed towards the door. Here’s to you, wherever you are: having joined your family finally or still waiting. You made that day special for me, thank you. I will never forget it. Another blog post about an older piano player I met in Berlin, listened to his playing and learned his story: War Babies. Posted in Personal Entries, Writing and Writers. Tagged american dream, atlanta, chopin etudes, flash memoir, georgia, hungarian jew, memories, paying it forward, piano player, writers, writing. Previous: Previous post: Homo-Ignorance: Are You Part of the Problem?